Did you know the energy of your home has the ability to transform your life? Everything you surround yourself with can inspire you to great heights or drag you down to being unable to move forward and live a fabulous life. We talk a lot about mind, body & spirit, but many forget about the space! This is where Feng Shui comes in … Your Space Matters! All the different areas of your home have a direct energetic connection to the universe. Feng Shui is all about harnessing that energy and making it work for you. 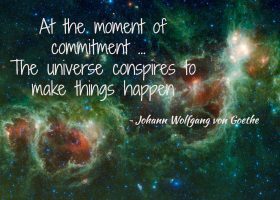 “At the moment of commitment … The universe conspires to make things happen!” ~ Goethe. I love this quote … It reminds me that I have the ability to guide my life in the direction I want. Bringing my energy and passion to my life and creating something beautiful, happy and fulfilled. Your home can help you do and be all that you want. I often speak of my beginning with Feng Shui … my life changed in the most amazing ways after embracing this beautiful art & science. They say when you are ready the teacher will show up … I have never been more connected to this than now. I love sharing and teaching about Feng Shui, I feel like I found my path and love every moment of helping people discover the hidden magic that surrounds them in their environment. I sometimes feel like where was all this wisdom all my life … but there are no accidents and you must go through everything to become the amazing person you are meant to be. And … everyone is meant to have a wonderful life, whatever that means for each and every one of us. Be amazing and true to the only one that truly matters “You” with a little Feng Shui magic.